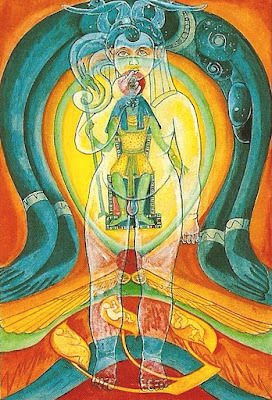 "Around the top of the card is the body of Nuit, the star-goddess, who is the category of unlimited possibility; her mate is Hadit, the ubiquitous point-of-view, the only philosophically tenable conception of Reality. 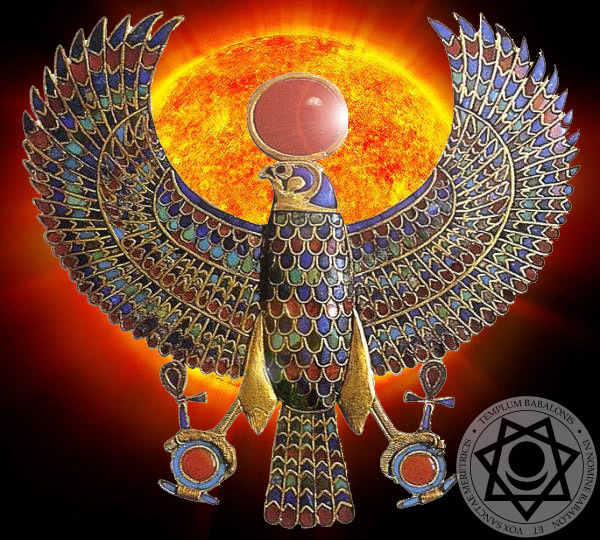 He is represented by a globe of fire, representing eternal energy; winged, to show his power of Going. As a result of the marriage of these two, the child Horus is born. He is, however, known under his special name, Heru-Ra-Ha. A double god; his extraverted form is Ra-hoor-khuit; and his passive or introverted form Hoor-pa-kraat. He is also solar in character, and is therefore shown coming forth in golden light." In the new Aeon, the one we are in right now (according to Thelema vision), individuality is of high importance as well as personal freedom, assuming responsability, not hiding behind gods but acting with understanding, wisdom and light strenght. These are not some guidelines for new Aeon parenting....although, I imagine, a truly loving parent would certainly want for his child to grow up along these lines. In my view, what follows is a direct, albeit veiled in heavy symbolism, description of the stage of consciousness right at the end of the Path. Comments not needed, for everyone of us is alive enough to attain Heruraha. "It is a little child covered with lilies and roses. He is supported by countless myriads of Archangels. The Archangels are all the same colourless brilliance, and every one of them is blind. Below the Archangels again are many, many other legions, and so on far below, so far that the eye cannot pierce. And on his forehead, and on his heart, and in his hand, is the secret sigil of the Beast. And of all this the glory is so great that all the spiritual senses fail, and their reflections in the body fail. This child danceth not, but it is because he is the soul of the two dances, - the right hand and the left hand, and in him they are one dance, the dance without motion." Yet by none of these can man reach up to me. Yet by each of them must man reach up to me."